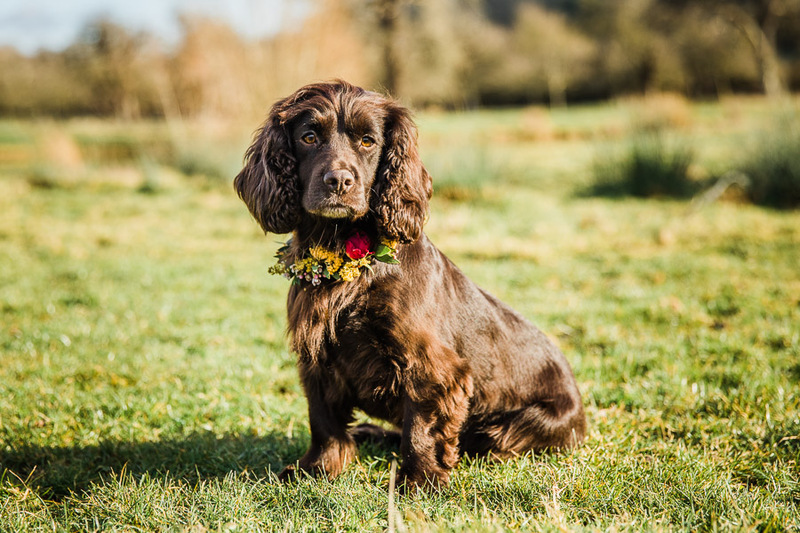 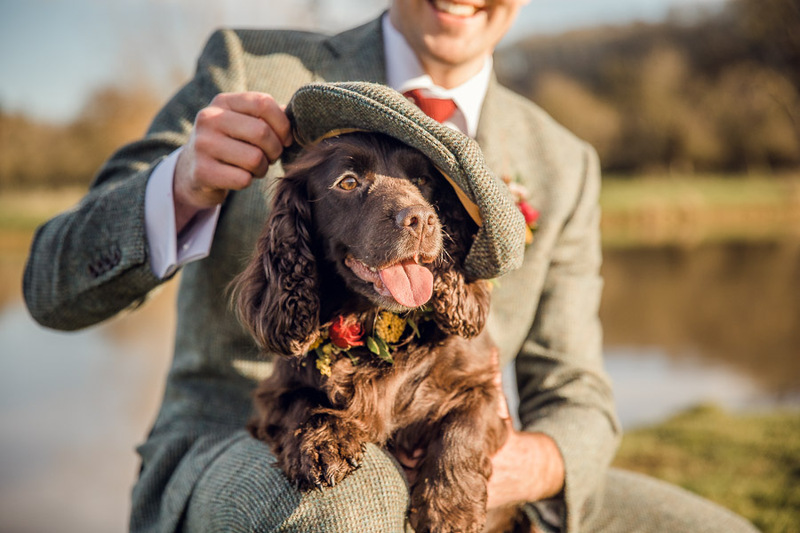 The inspiration for this Quintessential Cotswold Country shoot came from photographer Hannah’s life in the Gloucestershire countryside. 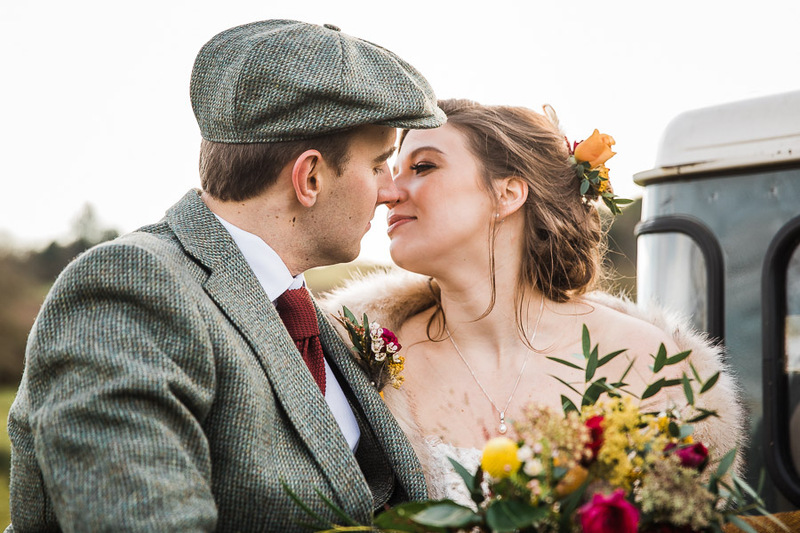 A country girl at heart she finds every opportunity to incorporate rural life through the seasons into her wedding and portrait photography. 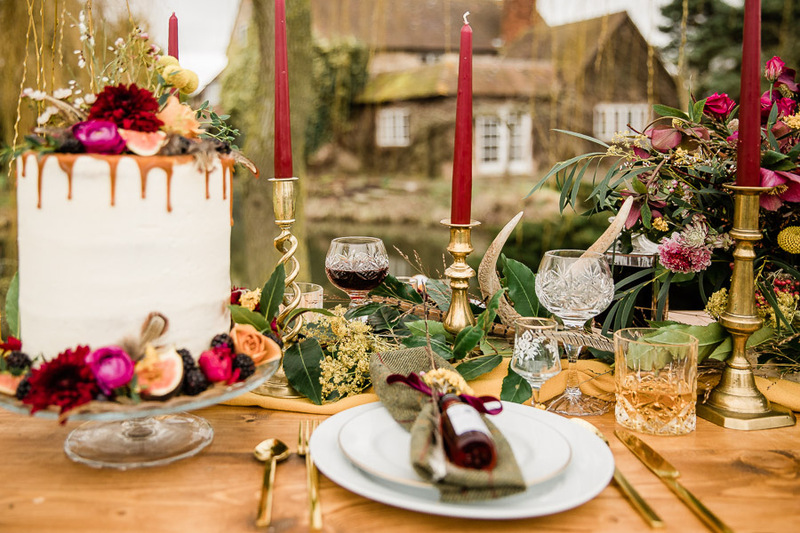 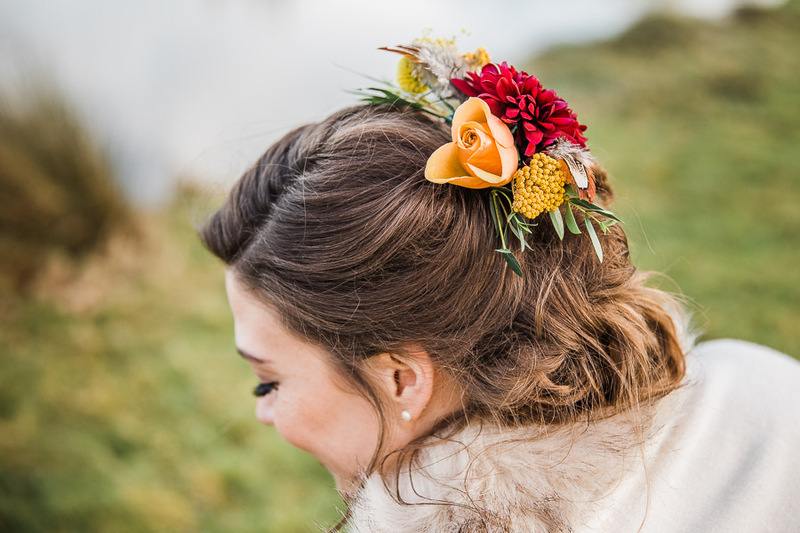 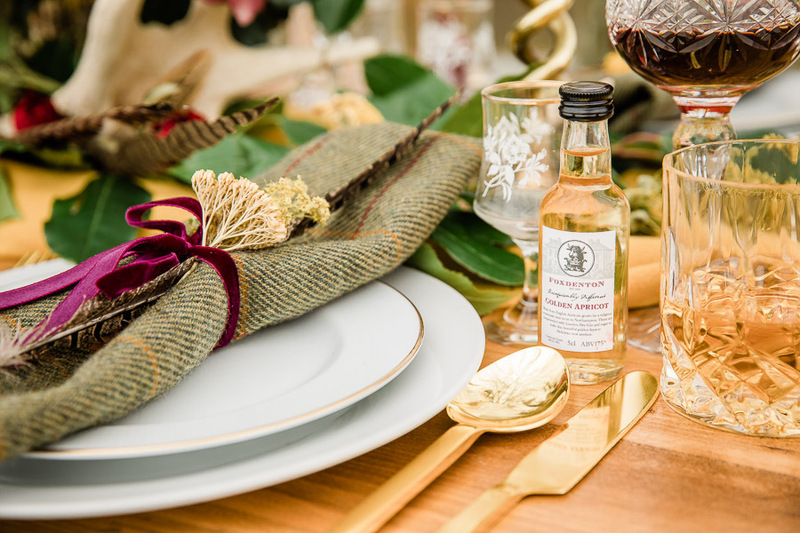 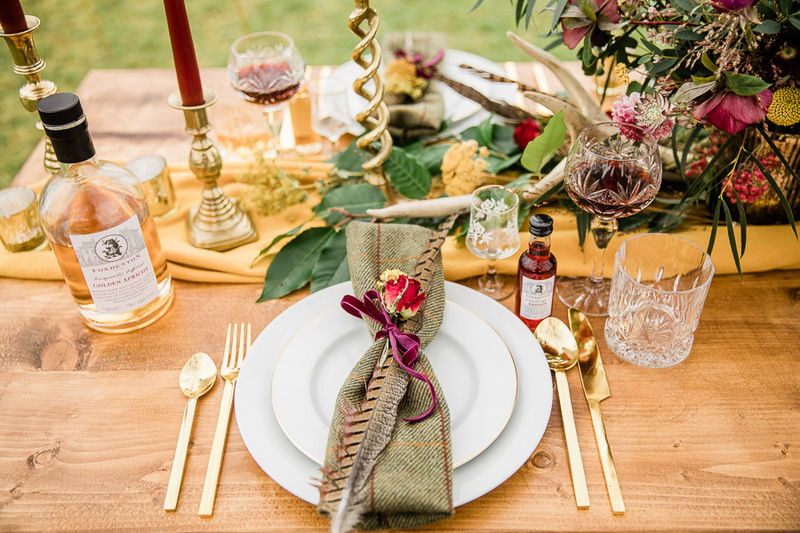 The rich tones of burgundy and on-trend mustard yellow are the perfect palette for a winter wedding; and pair beautifully with tweed for a rustic, textural feel. 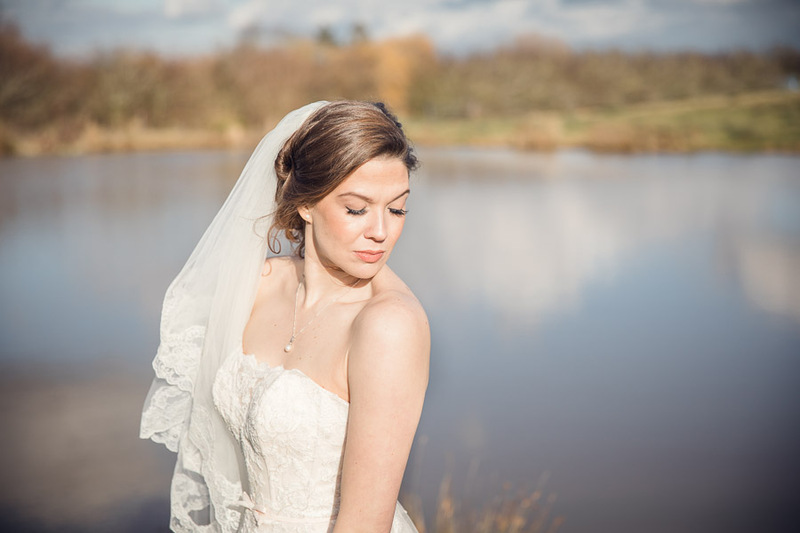 The setting of a local farm provided a scenic country backdrop, with stunning lakes, orchards and woodlands. 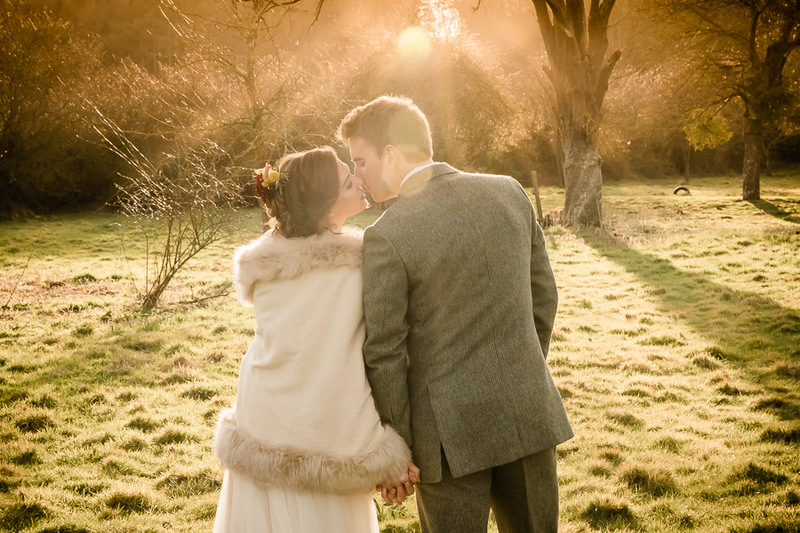 The shoot was bathed in winter sunlight; showing that winter weddings don’t have to be confined indoors. 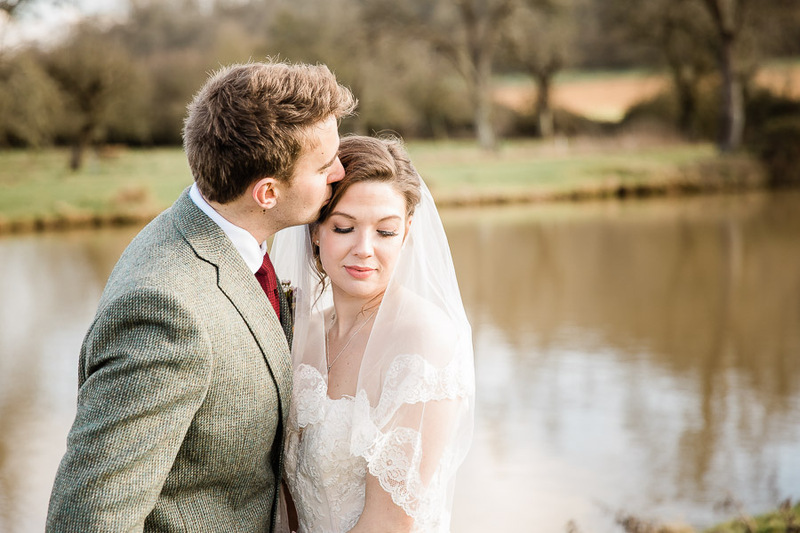 For Hannah, capturing couples’ character and personality is first and foremost the most important part of any wedding portraits. 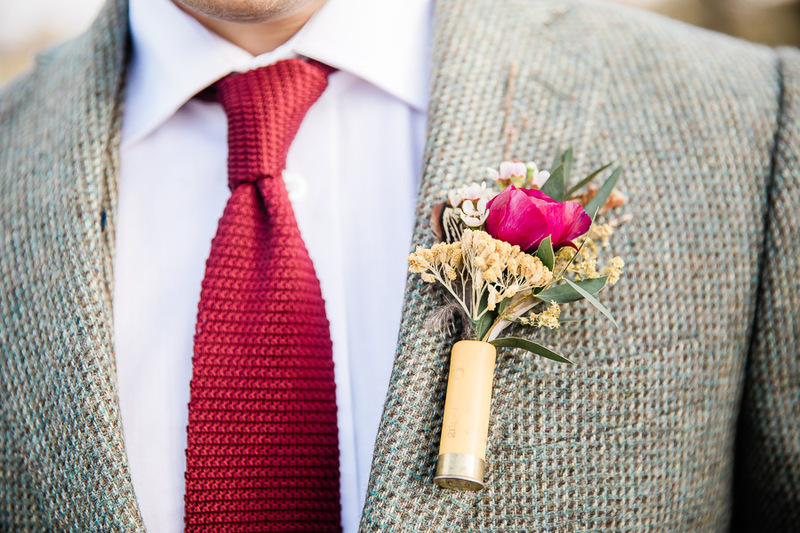 Florals and textural elements like feathers, antlers and tweed are key for this look. 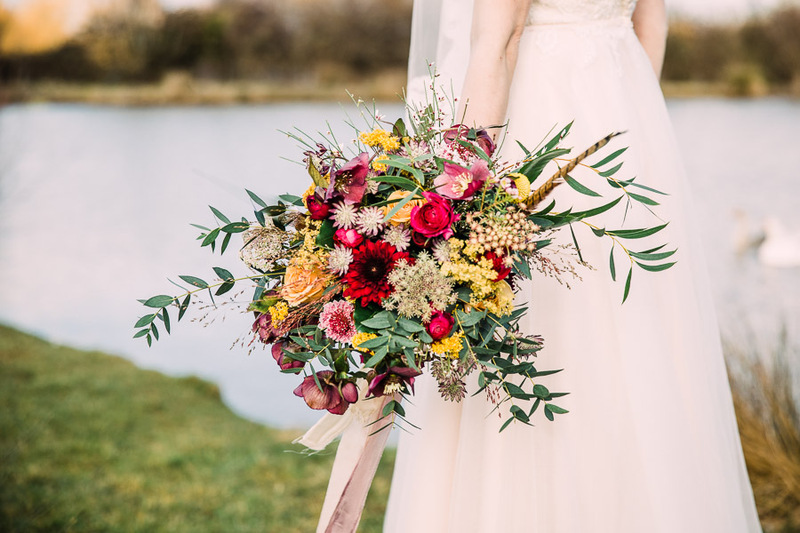 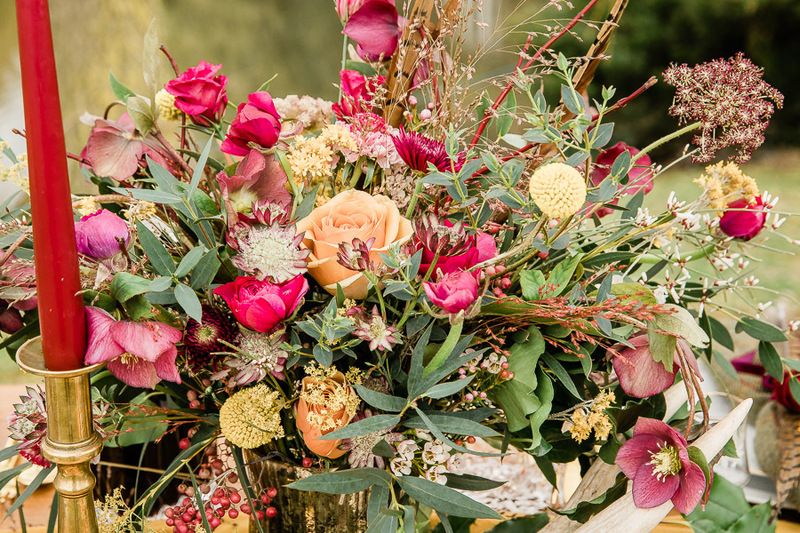 Jenny Fleur brought together seasonal flowers such as burgundy ranunculus and hellebores with textured dried flowers in a mustard yellow. 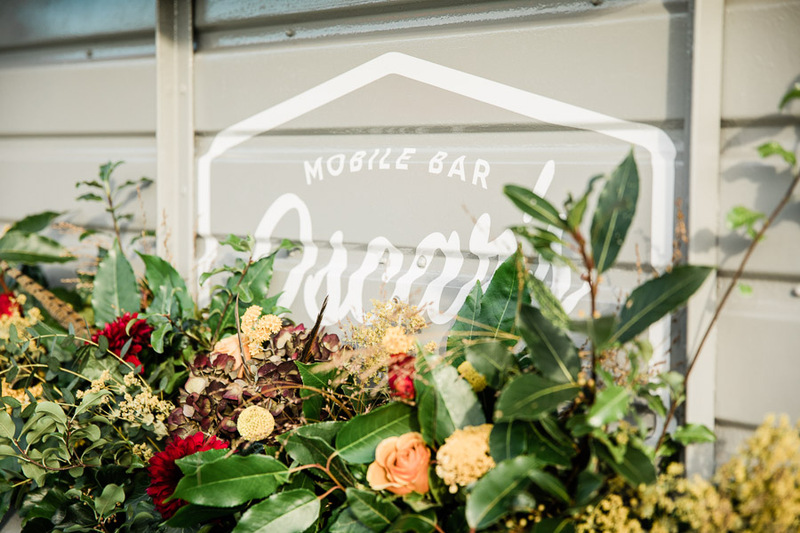 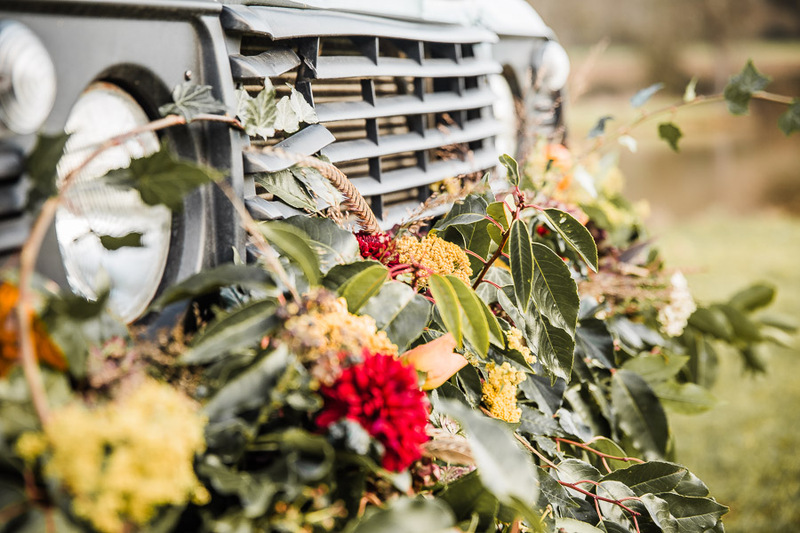 She styled the horsebox and Landrover with garlands of fresh foliage, florals and pheasant feathers. 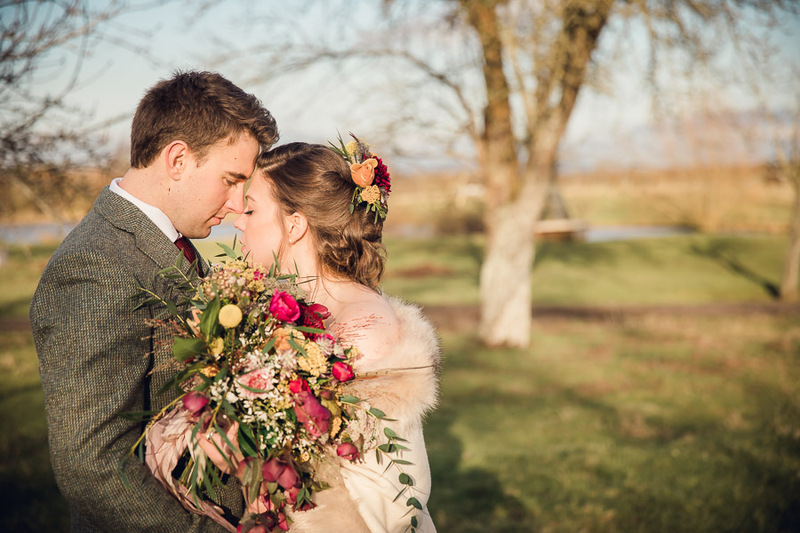 Our bride held a natural bouquet of seasonal flowers, bound with Jenny’s hand dyed silk ribbons. 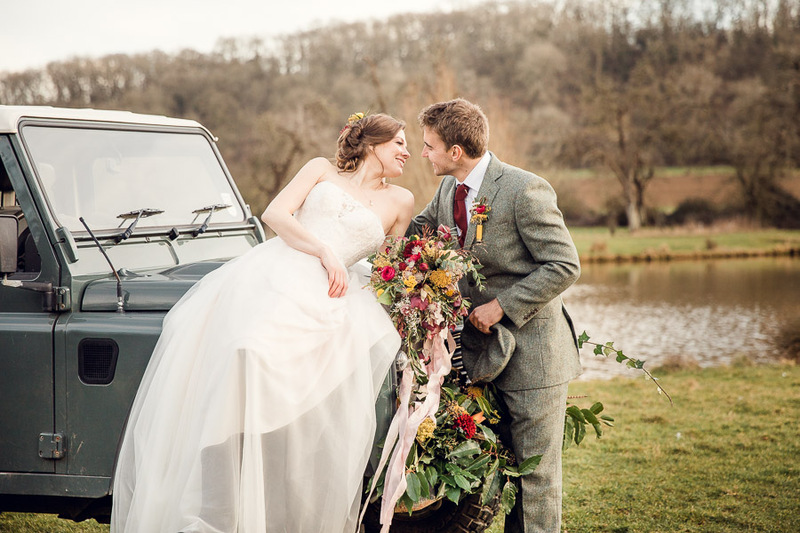 Our beautiful bride wore an Alfred Angelo dress from Sarah at By Design in Gloucester, the palest shade of blush pink with subtle lace details fitted in perfectly with the natural country style. 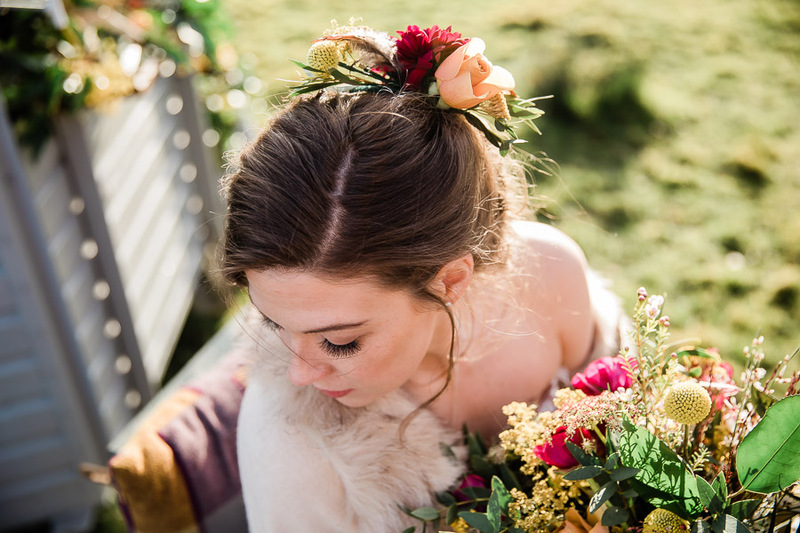 Sasha Brown created a softly curled bridal up-do and applied beautifully natural make-up for a romantic, English rose look. 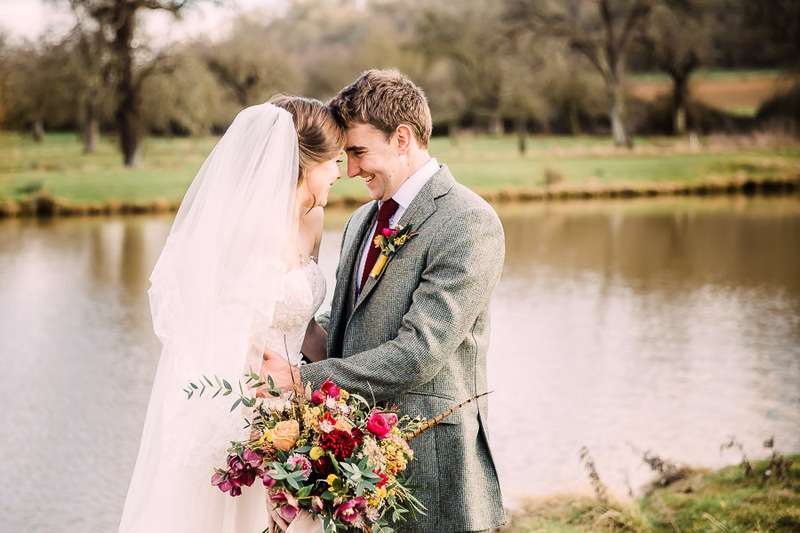 The bridal style was completed with a lace-trimmed veil, floral hair comb, a stylish Hicks and Brown burgundy fedora and later on a cosy faux fur-trimmed cape. 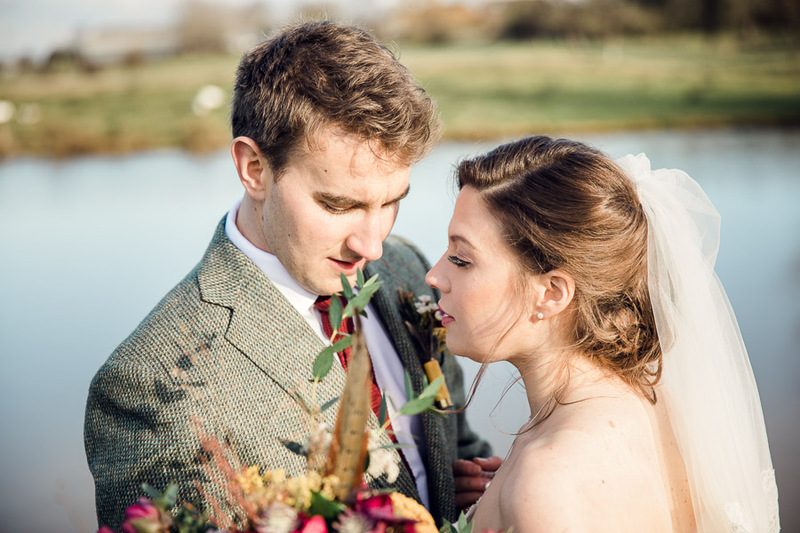 Our groom was smartly dressed in a beautifully tailored tweed suit from Oliver Brown. 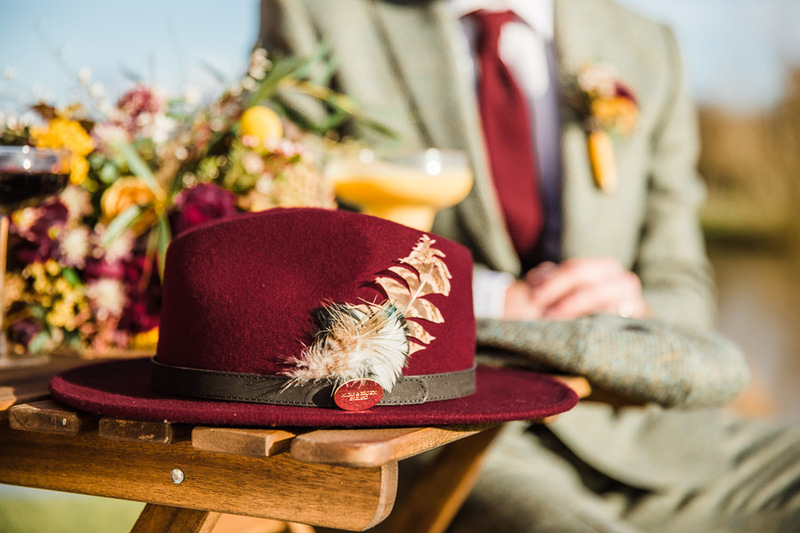 Quite the look for a discerning country gent and a great alternative to the traditional morning suit that can be worn again for a day at the races! 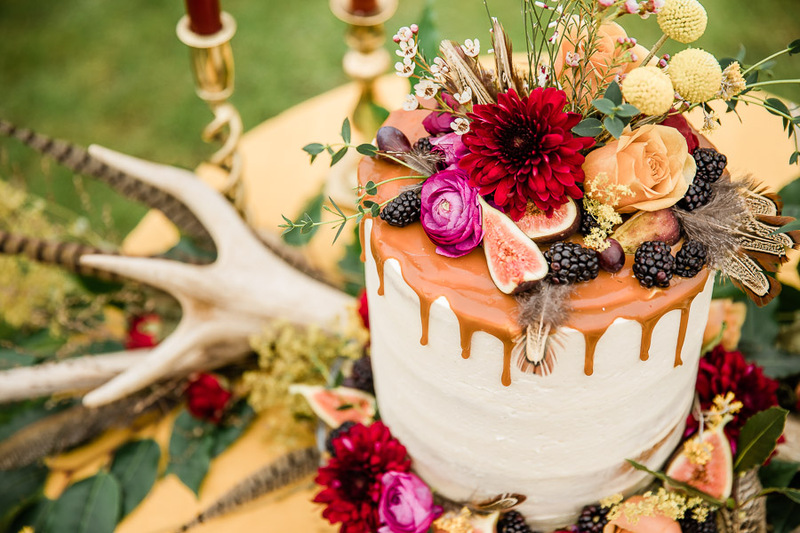 Jane from Gertrude Olive Cakes provided a delicious looking semi naked toffee drip wedding cake. 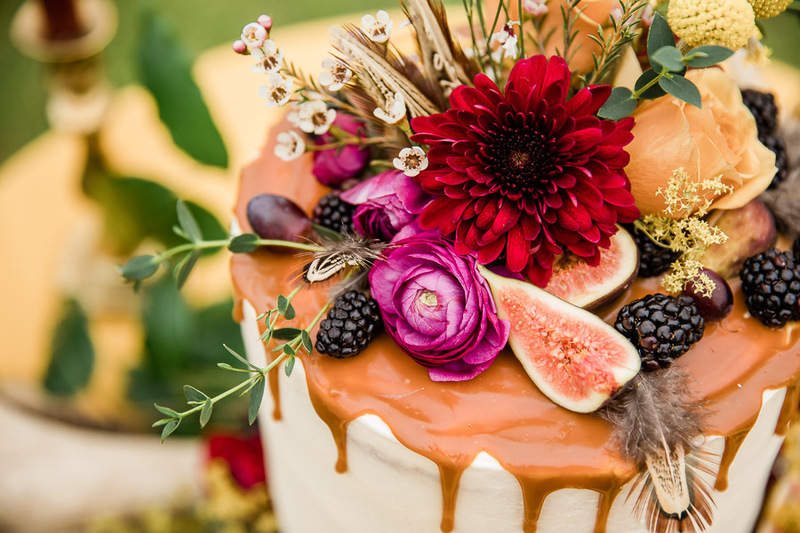 Together with Jenny Fleur the cake was decorated with flowers and seasonal fruits like Figs and Blackberries. 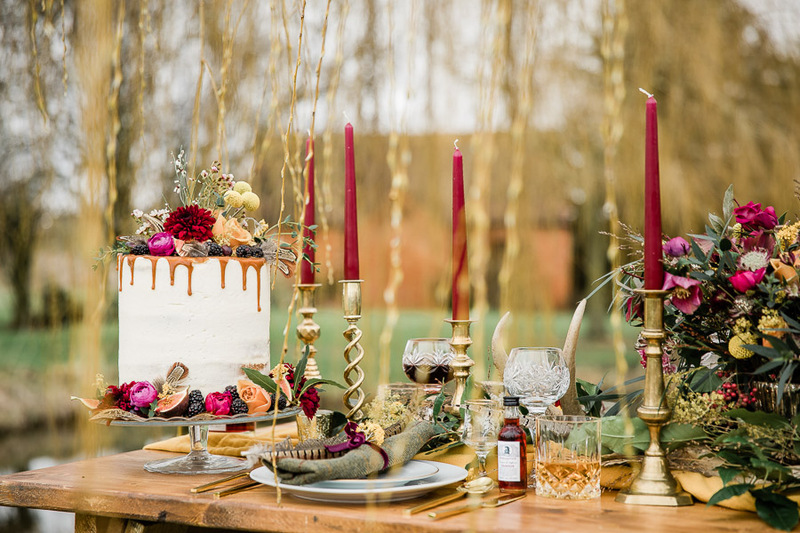 Jenny styled the cake table with brass candlesticks with burgundy candles, antlers, feathers and more florals. 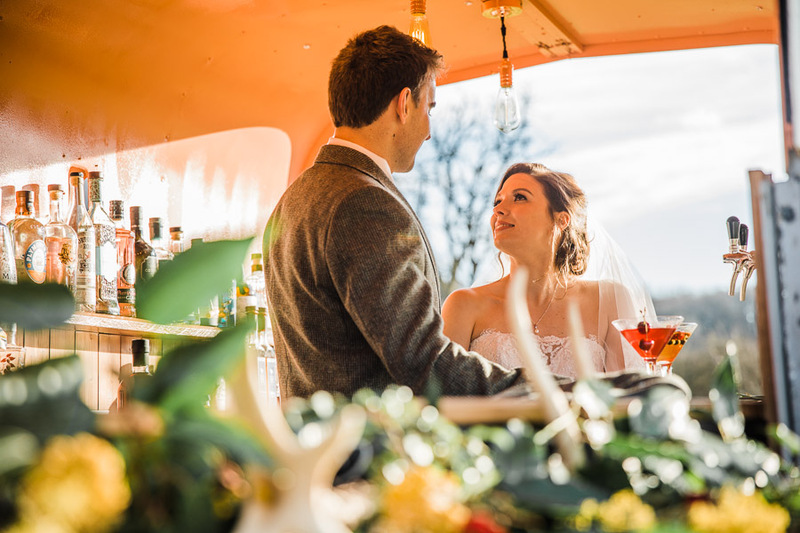 What could be more fitting for a country wedding than a horse box converted into a gin bar towed by a traditional Landrover. 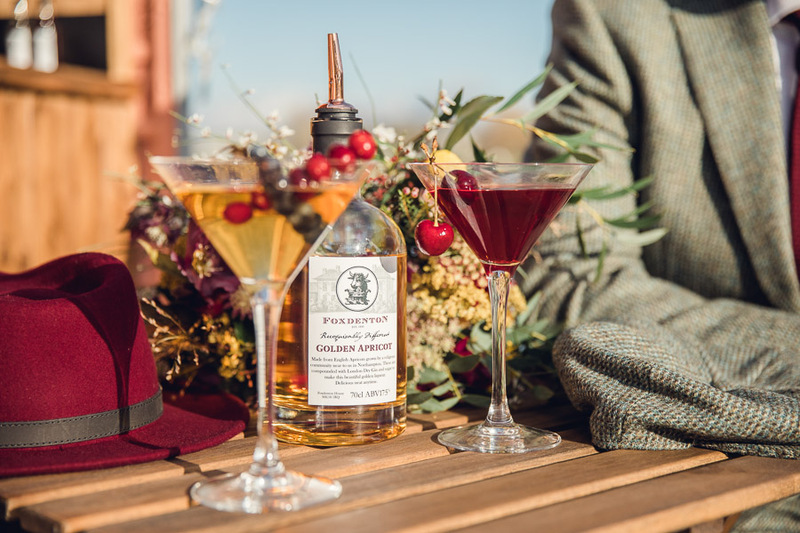 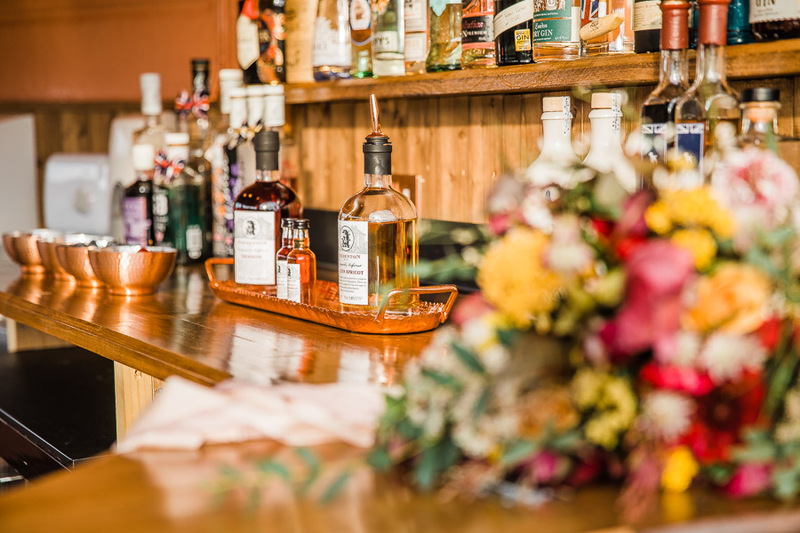 Oscars Bar Hire served up some winter warmers in ‘Harriet’ the horsebox bar using Foxdenton Golden Apricot Gin and Damson Gin. 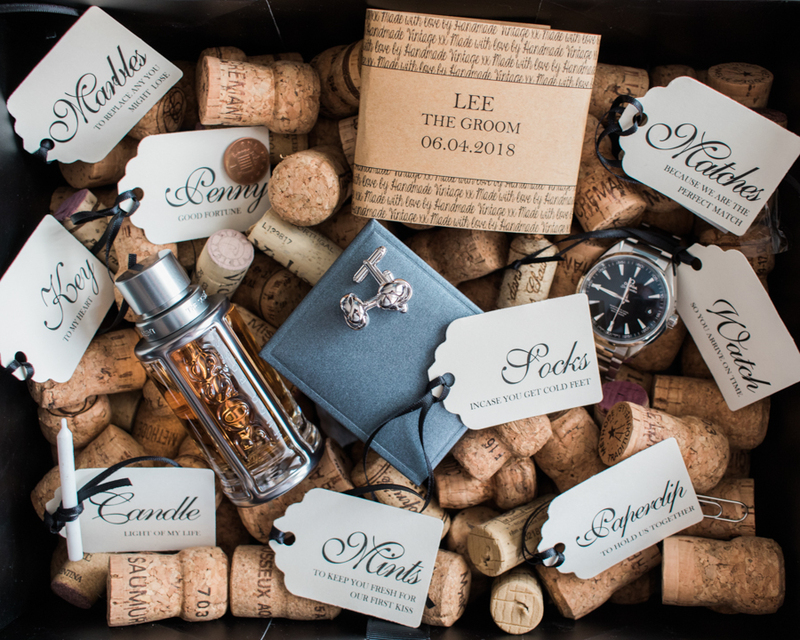 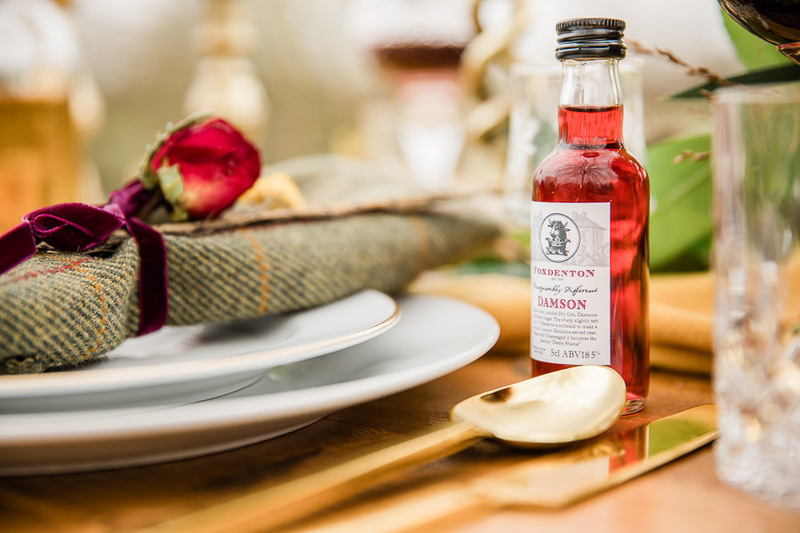 Miniatures of Foxdenton spirits featured as cute seasonal favours on the table. 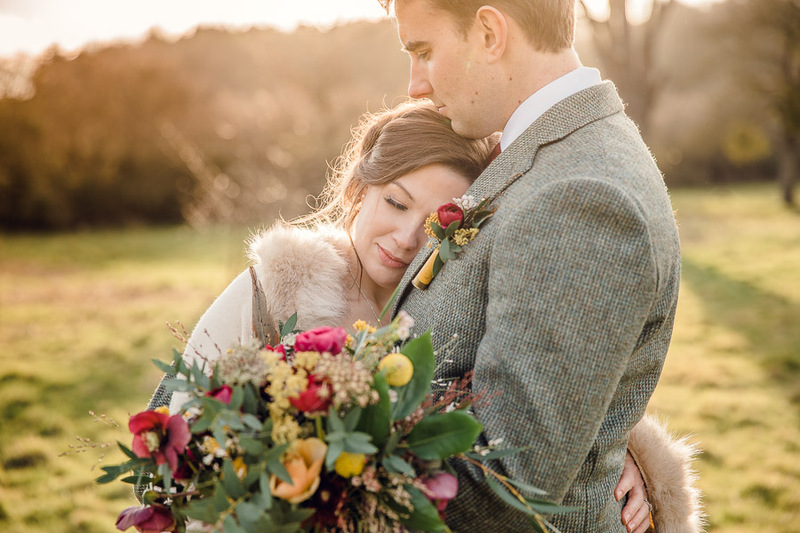 Jenny Fleur added cosy blankets in burgundy and mustard colours, this provided a warm and snug feeling. 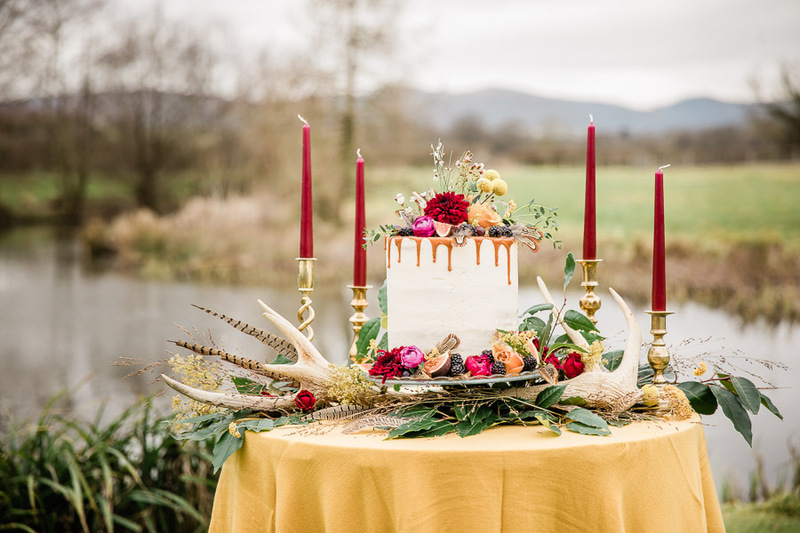 She also used a mustard throw as a cloth on our cake table and table scape. 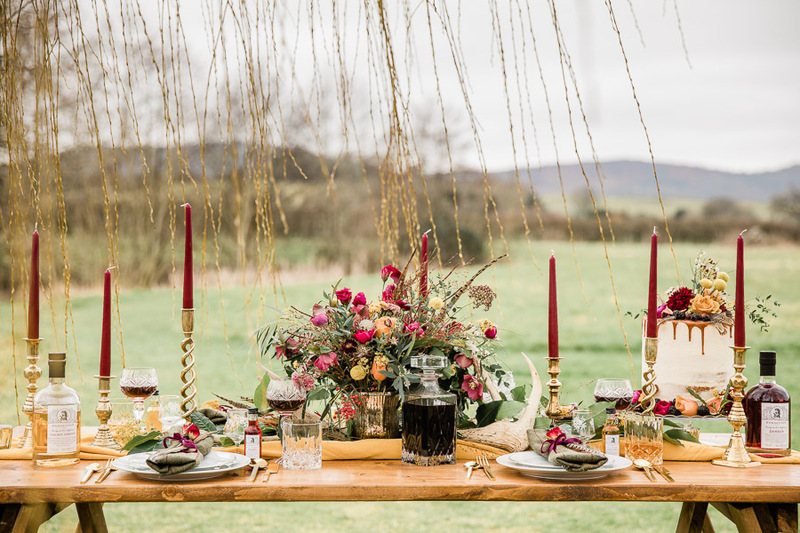 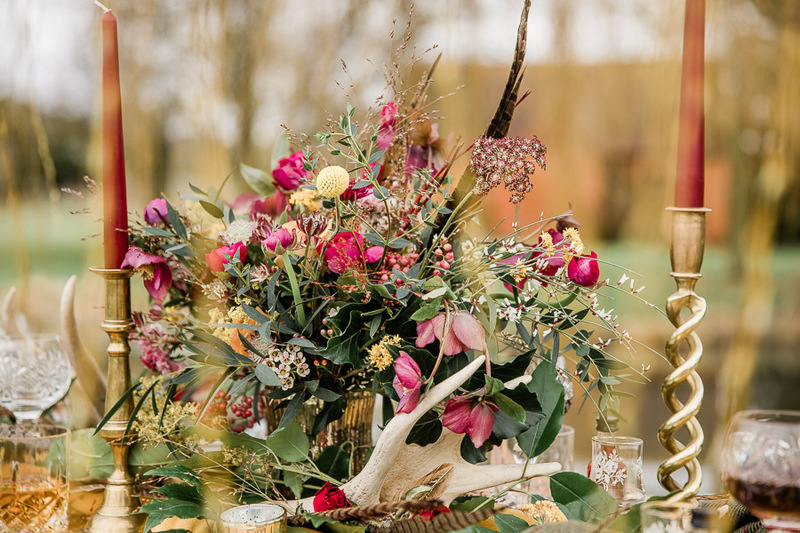 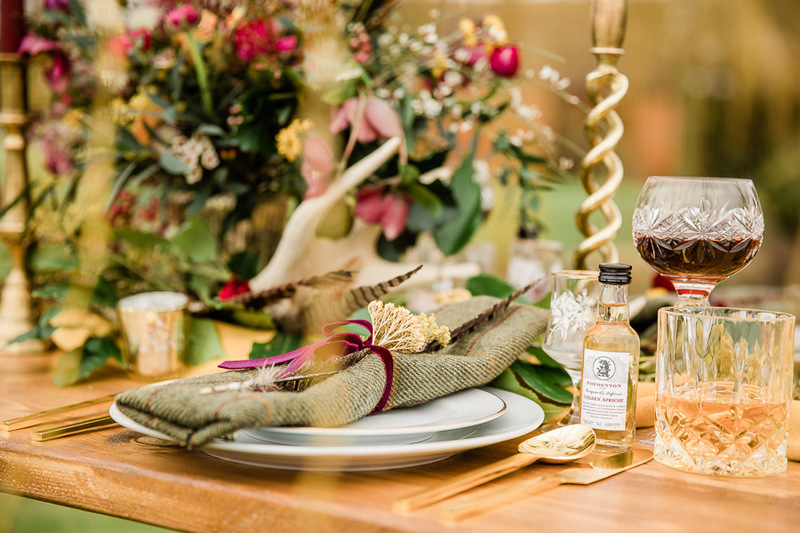 Jenny included vintage brass candlesticks, gold cutlery, crystal cut glassware, tweed napkins, pheasant feathers and antlers to complete the look.